Hands down the best travel card to own is the Chase Sapphire Preferred, it checks all the right boxes when it comes to benefits and features and gives anyone who loves to travel the best of the best for the right price. I’ve talked a lot about Chase Sapphire Reserve and how good it is for the heavy seasoned traveler, but not everyone can stomach the massive $450 annual fee for the card. Coming in at only $95 a year plus you get your first year free, this card gives you great 2X categories and increased redemption for travel through the Ultimate Rewards portal. So what makes this card so outstanding? In short, it’s reward earning rate plus reward redemption rate is the single best offer in the market today beating out the likes of American Express and Citi who both have competing travel cards in the market. This card is the ultimate companion when traveling giving you amazing features such as trip cancellation protection, car rental insurance waiver, roadside assistance, and more. Everything that you could possibly need protection from or perks from while on a trip comes contained in this metal card that will quickly become your go to card. I spend a lot on travel and dining, the two categories that give you 2X the points on each purchase helping you rack up the points quicker. That’s 2X the acceleration to your next full on vacation or your next weekend getaway is right here contained in this card. 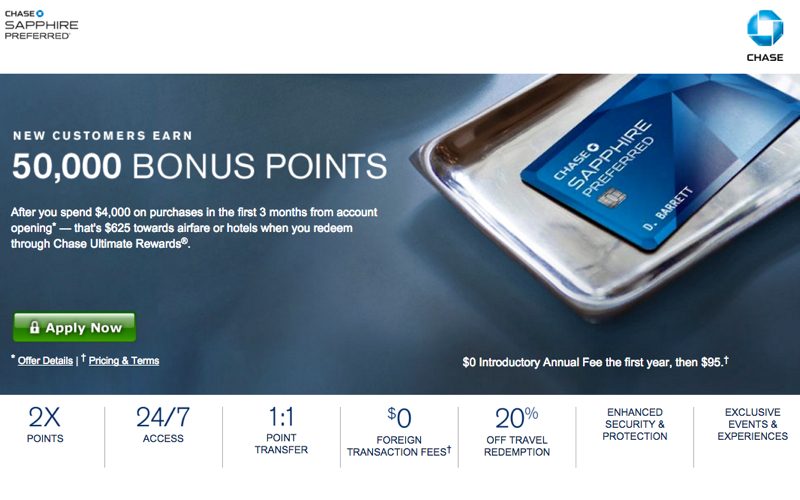 And when you go to redeem your points you get an increased 1.25 cents-per-point on your travel redemptions through the Ultimate Rewards travel portal making your points even more valuable for redemption on travel such as flight, hotels, and car rentals. If you don’t feel like redeeming through the Ultimate Rewards travel portal you have the option to use your points so many more ways including transfers to top rated travel partners, most at a 1-to-1 conversion, or as straight cash back on your statement. The signup bonus for this card is pretty incredible. On initial signup you’re offered 50,000 Ultimate Reward points after $4000 in spending within the first three months which is easily doable. On top of that if you add an authorized user to your card within the signup bonus window you will get an additional 5,000 Ultimate Reward points for adding that user. All together with just the signup bonus you’re looking at 55,000 Ultimate Reward points which can be redeemed for $500 in statement credit, transferred at a 1-to-1 ratio to a transfer partner, or redeemed for $687.50 in travel through the travel portal. For even the most occasional traveler the Chase Sapphire Preferred provides all the best and greatest travel features for a low $95 annual fee. You simply will not find another travel card offering this many benefits in the market today. Chase has gone above and beyond what anyone could ask for in a travel credit card and it’s a must have in anyone’s wallet. With the great transfer partners, 25% bonus for booking through the travel portal, and 2X earning rate at travel and restaurants this is the absolute perfect card. You simply will not find another travel card offering this many benefits in the market today. Chase has gone above and beyond what anyone could ask for in a travel credit card and it's a must have in anyone's wallet.